1. The words with which a great Bishop and orator, Bossuet, began the funeral oration of a great king, are well remembered in history: "God alone is great." This is true in the absolute sense of the word. We are all insignificant, because any greatness which we can possess is not ours, but comes from God. There is in the world, however, one man in whom the greatness of God is reflected in the most outstanding way of all. He participates in the authority and in a certain sense in the personality of Christ. This man is the Vicar of Jesus Christ, the Pope. These words need to be though about rather than explained. The church is compared to a building which must rest upon one foundation stone: the Pope. The Church is compared to a flock which has only one shepherd: the Pope. To him is entrusted the divine power of binding and loosing upon earth. This power is granted to him personally. It is given to the other Apostles only as a group united to him. These words , almost incapable of being translated because of their tremendous power, fully express the greatness of the Pope. He is Priest and Supreme Pontiff, the Prince of Bishops, the heir of the Apostles, the living Peter, Christ Himself ... To him are entrusted the keys of Heaven which he can open or close; to him alone, as to one supreme Pastor, is entrusted the whole flock of the faithful and to shepherds alike. His power extends to the ends of the world and is under the protection of God, Who has promised to confirm in Heaven whatever he will decree upon earth. His dignity and authority, then, are almost divine. 3. Let us bow humbly before such greatness. Let us promise to obey the Pope as we would Christ. When he defines doctrine as supreme Head of the Church, he is infallible. When he commands or exhorts, he does so in the name of God. We cannot dispute or murmur against anything which he teaches or decrees. To disobey the Pope is to disobey God. To argue or murmur against the Pope is to argue or murmur against Jesus Himself. When we are confronted with His commands, we have only one choice --- absolute obedience and complete surrender. Moreover, we owe the Pope our veneration and love. If we love the Pope, it is like loving Christ. Pray for the Pope, that his commands and desires may be fully realised for the greater triumph of God's kingdom upon earth.
" Come, let us investigate even more diigently who you are; that is, what part you play in the Church of God at this time. Who are you? The high priest, the Supreme Pontiff. You are the prince of the bishops, you are the heir of the Apostles; in primacy you are Abel, in governing you are Noah, in patriarchate you are Abraham, in orders you are Melchisedech, in dignity you are Aaron, in authority you are Moses, in judgment you are Samuel, in power you are Peter, by anointing you are Christ. You are the one to whom the keys have been given, to whom the sheep hae been entrusted. It is true that there are other doorkeepers of heaven and shepherds of flocks; but you are more glorious than all of these, to the degree that you have inherited a name more excellent than theirs. They have flocks assigned to them, one flock to each; to you all are assigned, a single flock to a single shepherd. You are the one shepherd not only of all the sheep, but of all the shepherds. Do you ask how I can prove this? From the word of the Lord. For, to whom, and I include not only bishops but also Apostles, were all the sheep entrusted so absolutely and completely? 'If you love me, Peter, feed my sheep.' What sheep? The people of this or that city or region, or even of this or that kingdom? 'My sheep,' he said. To whom is it not clear that he did not exclude any, but assigned them all? There is no exception where there is no distinction. And perhaps the rest of the disciples were present when the Lord, entrusting all to one man, commended unity to all in one flock with one shepherd according to the statement, 'One is my dove, my beauty, my perfect one. Where unity is, there is perfection. Other numbers do not possess perfection but division, as they depart from unity. Thus it is that each of the other apostles received a single community, for they understood this mystery. 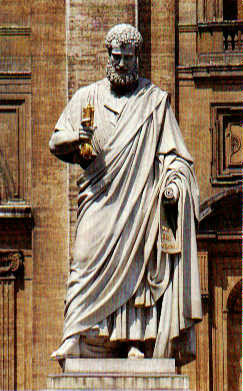 James, who appeared as a pillar of the Church, was content with only Jerusalem, leaving to Peter the universal Church. It was fitting for him to be placed there to raise up offspring for his dead brother in the place where he had been killed, for James was called the brother of the Lord. Now if the brother of the Lord yields to Peter's prerogative, who else can lay claim to it?"